The journey to get this certificate was the longest, hardest and most cherished one for me. I had to get past several challenges professionally and emotionally. Back then it was called Advanced Developer (501). The exam is broken down into three parts. Multiple choice examination, a programming assignment, and an essay. My advanced developer journey spanned several years, let me break down the timelines. Jan 2013, with 3 years of experience working on the platform I took the multiple choice certification and miserably failed. April 2013, I regrouped myself and studied harder re-took the examination and passed, that was one of the happiest feelings. April 2014, a year later I was able to get a schedule for the programming assignment. The scheduling was only twice a year and slots gets full in just a matter of minutes of being open. June 2014, got the programming assignment. I wasn’t prepared and felt it was the hardest challenge ever. I failed the assignment. 2015, couldn’t get into any schedule as slots are already full. Jan 2016, finally got in and received the new programming assignment. Feb 2016, the hardest month of my life as my mom past away and I couldn’t get myself to finish the assignment and I decided to cancel/forfeit the assignment. 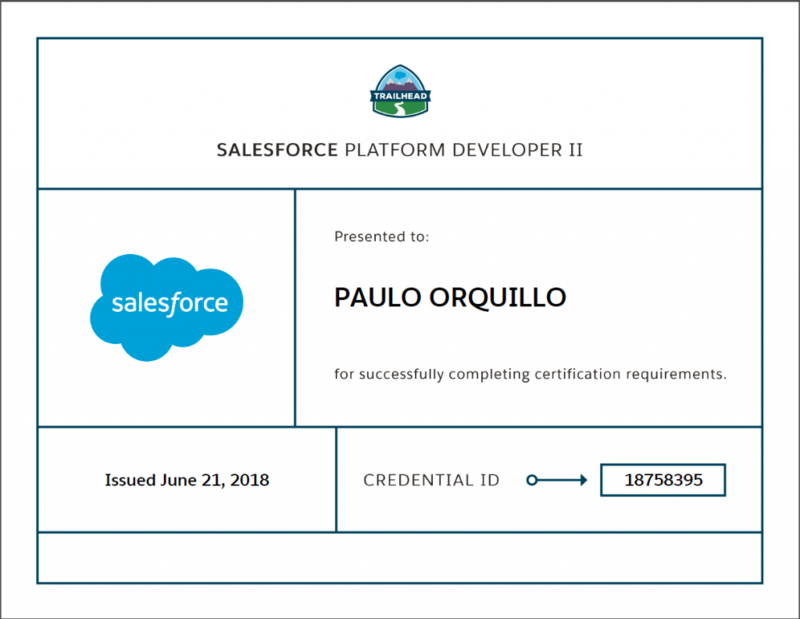 Jan 2017, Salesforce transitioned the certification to Platform Developer II. Took the transition exam and passed. No programming assignments slots being offered anymore. mid-2017, Salesforce released a new superbadge called Advanced Apex Specialist in Trailhead. This turns out to be the replacement to the programming assignment. June 2018, the Advanced Apex Specialist was a tough cookie, but I have more experience now and mentally ready. Got the superbadge and after a week received an email with my certification. I finally got the most coveted Platform Developer II certification, approximately 5 years since I started. This is amazing. Very well deserved Paulo.